This Easy Shrimp Alfredo is perfect for the busiest of busy nights. It’s ready in about 15 minutes and looks as though you spent hours on it. Since it is a busy time of the year for me with all the Christmas things that need doing, I love a tasty meal that looks and tastes great, too. Why not add it to your collection of easy shrimp recipes? 30 minute meals are some of my favorite. It’s great to have a collection of them all set to go on busy week nights! I have to admit. I have a little helper here. This is one of my semi home made recipes. Tonight’s helper is Knorr side dish pasta mixes. I even used skim milk to make the recipe to lighten it up a bit, but the mix still thickens up and tastes like it is full of cream and butter. 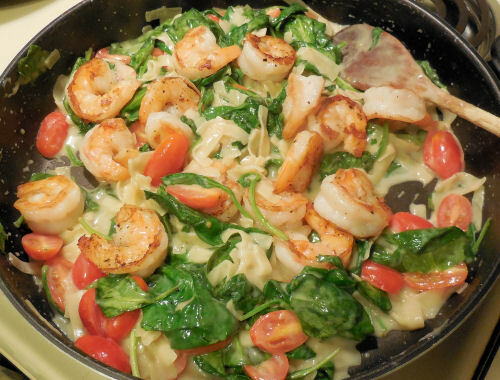 This recipe for Easy Shrimp Alfredo uses Knorr Pasta Sides – Alfredo. 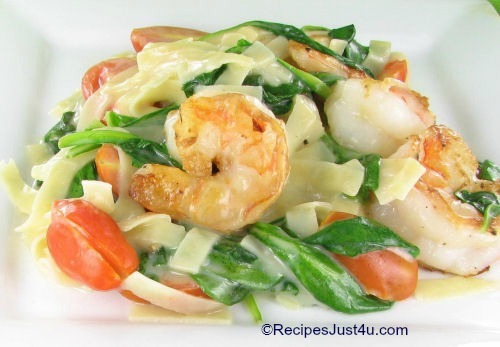 It is quick and easy and taste just like restaurant shrimp Alfredo but at a fraction of the cost in both the pocket book and the calorie bank! Start by placing water, skim milk and butter into a skillet and heating it. Don’t substitute margarine. Use the real deal. Butter makes all the difference in the flavor. Mix in the packet of Knorr’s alfredo sauce mix. 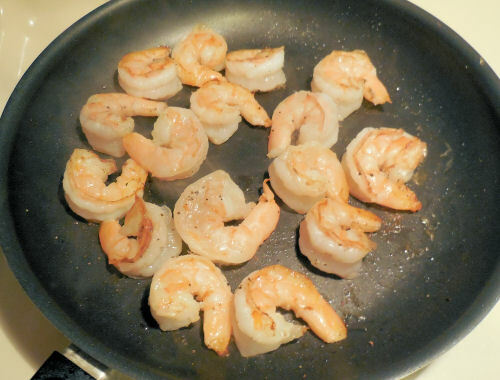 Heat the olive oil in a separate fry pan and add the shrimp and cook until just pink. (do not over cook) Set aside and keep warm. 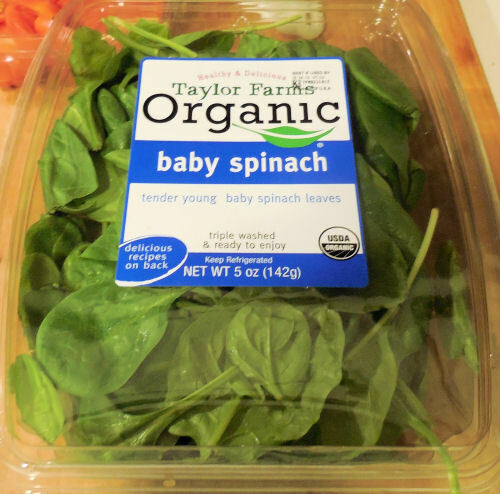 I use organic baby spinach. Add the cooked shrimp and serve with a pretty salad. Enjoy! This recipe is seriously delicious. The Alfredo sauce is light and not at all overpowering. 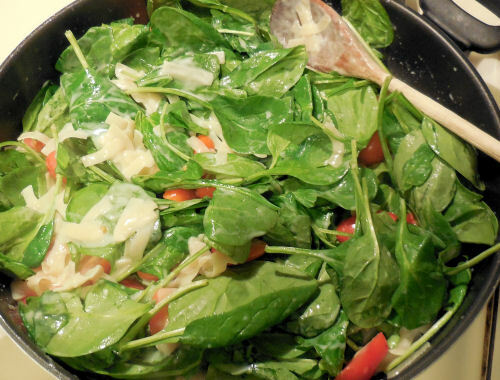 The spinach adds the most unbelievably fresh taste to the dish. I will definitely put this on my list of must have dishes for busy week nights. Take some plain shrimp and turn it into an upmarket taste in just minutes with this easy shrimp Alfredo recipe. 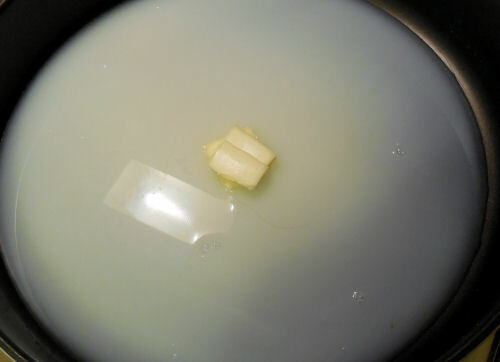 Add the water, milk and butter to a saucepan and bring it to a boil. Stir in the contents of the Knorr sides Alfredo mix and cook for about 6 minutes. Meanwhile, Heat 1 tbsp of olive oil in a separate frying pan and cook the shrimp a couple of minutes on each side until they turn pink. Remove from the heat and keep warm. 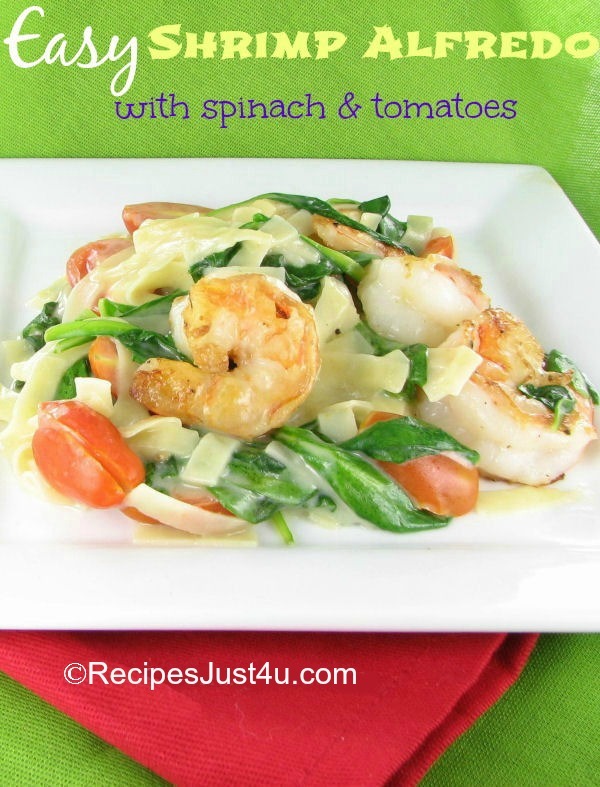 Add the reserved cooked shrimp and serve with a tossed salad for a delicious and quick week night meal. im going to make this dish for tonight’s dinner. It doesn’t say but I’m assuming the pkt of Alfredo sauce gets mixed into the milk mixture. It looks yummy! 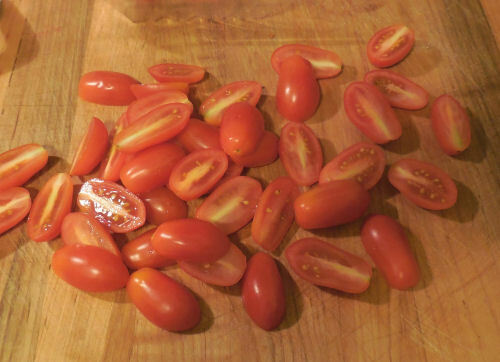 WOW, this recipe is sooooooooo easy and looks soooooo delish, can’t wait to try it, thanks!